“Trissie’s Dollies” – from Bournemouth to London via three gardens in 40 years. Last year I either discovered, or re-remembered, that my friend, contemporary and colleague Julia Richter had been taught by Rosemary Barnes, who was a friend and colleague of my piano teacher, Trissie Cox. 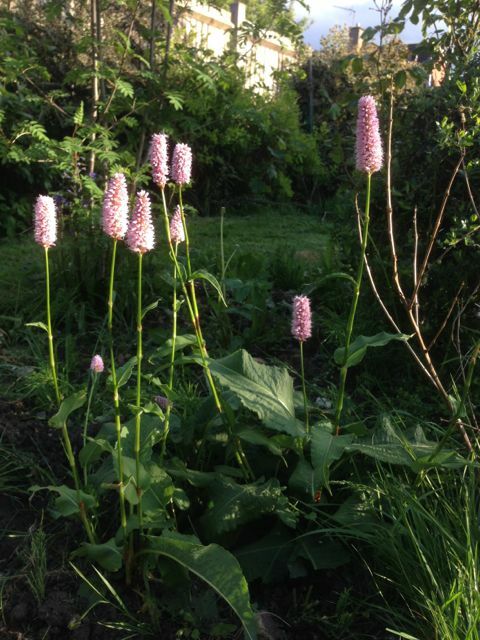 Julia said that she had in her garden what Rosemary had called “Trissie’s Dollies” (her nickname for “persicaria bistorta” or “common bistort“). That is to say, many years ago, Trissie had given Rosemary some of the plants for her garden, and Rosemary had given Julia some of those. Then In turn, last year, Julia gave me some of hers for my garden. And so here they are: plants from my piano teacher’s garden, uprooted and replanted three times, and flourishing a hundred miles away some 40 years later. It would be nice to think that I’ll have a reason to give a few to someone else one day. It struck me that this is what happens to tunes when they pass from one person to the next. The person you got them from doesn’t lose them, they just give you a bit of the plant stock, and then you have some to play with too. You transport those tuneful plants all over the place, and they grow, as if they’d always been yours, and that’s probably how others think of them. It’s only when you come to blog about how you arrived at your repertoire (like I sometimes do) that the journeys become clear – and then only to people who read it. What caused me to think all of this was a lovely incident in the seminar I was teaching at in Ljubljana for ballet teachers and pianists. We were looking for music for an exercise, and one lady played a beautiful, plaintive waltz. A Russian teacher at the back of the studio gave a deferential nod and said “Thank you for that” – because, as it turned out, this was a famous WW2 song, and it happened to be VE day, so it was appropriate in more ways than one. It was one of those moments where you see a dozen meaningful transactions at once in a split second – which funnily enough was what I was going to talk about in another lecture, with reference to Daniel Stern’s forms of vitality. I asked what the name of the song was, thinking that if it wasn’t in copyright, I’d put it straight in the 52 cards repertoire. It was Синий Платочек (Sinii Platochek/Blue Shawl). It is in copyright, unfortunately, so I can’t transcribe and put the score here, but here it is: choose your moment and play it for your Russian colleagues, or just for the sake of a beautiful song for class. As you’re doing that, you’ll be taking part in the kind of replanting and gardening activity that is the subject of this post. An astonishingly good page of links to scores of famous Russian waltzes, including Sinii Platochek, many of them in Sibelius format, some in pdf. There are orchestral scores as well as piano reductions. An even more astonishing custom – the Annual World Dock Pudding Championship. Dock pudding is made from the leaves of bistort. This entry was posted in Dance, Music and tagged Friends etc. on May 14, 2015 12:26 am by Jonathan Still.